Want Higher Ranking In Google?? Nothing Is Better Than HIGH PR BLOG COMMENTING SERVICE. Google Love These Kinds Of Back Links Because Your Website Is Linking To Authority Site That Is Already Index In Search Engines. This Service Is A WIN For Both Your Site, And Sites Where We Will Place Your Link With Additional Unique Content. Ask How? Let See When You Comment On Someone Blog You Are Adding Valuable Content To Their Site Right. Well You Are Also Getting Full Credit For The Content Is Already On That Page. COOL STUFF RIGHT. DO NOT WAIT. HURRY UP OTHERWISE YOUR COMPETITOR WILL TAKE ADVANTAGE OF THIS OPPORTUNITY. Why Should You Choose Our Service Over Our Competitors? 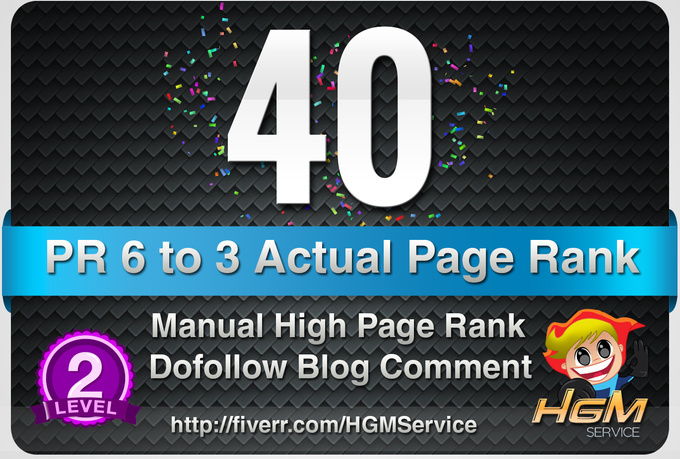 I will make 40 Manual DoFollow Blog Comment Actual PR 6 To 2 is ranked 5 out of 5. Based on 2 user reviews.